In the centre of the head is a figure, facing out, with arms rigidly outstretched. His feet are supported on a foot-rest. He is wearing a long-sleeved garment, and a short, belted tunic. His hands are under the front legs of two quadrupeds. Their heads are turning back to bite their tails. They have canine heads. 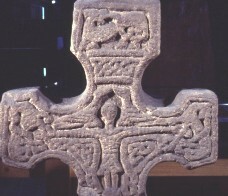 The spaces under the arms of the figure are filled with a triquetra knot. These knots are enclosed by the feet of the animals joining triangular mouldings with twisted terminals. The front legs of the animals touch the backs or tails or two crouching winged creatures. Their front legs are folded back on the shoulder of the central figure and their heads touch above his head. There is a four-strand plain plait dividing this scene from the upper arm. The upper arm has a backwards looking quadruped.